The interactive web application provides visualizations of avian influenza virus risk factors and models at the interface of wild and domestic birds. A virtual tour was produced to familiarize users with the capabilities of the application. This visualization tool helps researchers and public health officials see how relations between poultry density and waterfowl migration routes affect the threat of avian influenza to people and the poultry industry. The emergence of highly pathogenic strains of avian influenza, commonly referred to as bird flu, is a serious threat to our global economy and human health. The primary threat posed by highly pathogenic avian influenza comes from the high mortality rate in domestic (and sometimes wild) birds, which can cause significant economic losses. The secondary threat from highly pathogenic avian influenza is the possibility of human infection. Although instances of avian influenza becoming lethal to humans are rare, such infections are possible, such as when the Asian H5N1 virus evolved to incur a 60-percent case-fatality rate in humans. U.S. Geological Survey (USGS) scientists have been at the forefront of avian influenza research and are making great strides in improving our understanding of how this disease emerges and spreads. Recent research has resulted in a risk model for the spread of highly pathogenic avian influenza based on the ability of domestic birds to encounter wild fowl across space and time. The model incorporates key factors including the density of potential disease spreaders, viral uptake and shedding rates, and human density, which provides a comprehensive look at the many factors associated with the spread of highly pathogenic avian influenza. 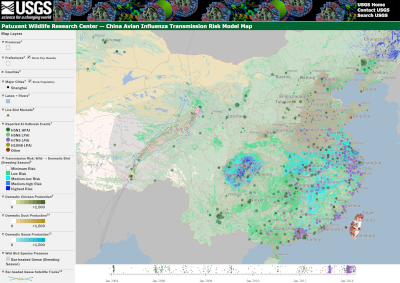 The Avian Influenza Visualization Tool makes this model easier to use so citizens and scientists alike can now see how these factors affect the risk of avian influenza transmission at this interface. This research is supported by the USGS Contaminant Biology Program and Wildlife: Terrestrial and Endangered Resources Program. Prosser, D.J., Hungerford, L.L., Erwin, R.M., Ottinger, M.A., Takekawa, J.Y., Newman, S.H., Xiao, X., and Ellis, E.C., 2015, Spatial modeling of wild bird risk factors for highly pathogenic A(H5N1) avian influenza virus transmission: Avian Diseases, v. 60, no. 1s, p. 329-336, doi:10.1637/11125-050615-Reg. Prosser, D.J., Laurent, K., and Kodad, Y., 2016, Visualizing models for avian influenza viruses—A web application tool: U.S. Geological Survey. Prosser, D.J., Wu, J., Ellis, E.C., Gale, F., Van Boeckel, T.P., Wint, W., Robinson, T., Xiao, X., and Gilbert, M., 2011, Modelling the distribution of chickens, ducks, and geese in China: Agriculture, Ecosystems and Environment, v. 141, no. 3-4, p.381-389, doi:10.1016/j.agee.2011.04.002.